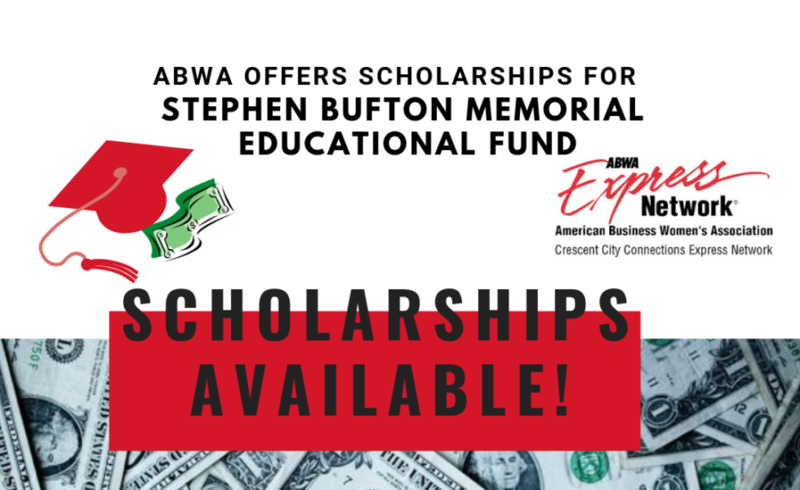 New Orleans, LA – The New Orleans Crescent City Connections Express Network of the American Business Women’s Association (ABWA) is offering four scholarships worth a total of $8,000 funded through the Stephen Bufton Memorial Educational Fund to four deserving area students. Applications must be completed by April 15, 2019. A minimum of three (3) eligible completed applications are required in order for the scholarship to be awarded. The scholarship recipients will be notified in July 2019. SBMEF, ABWA’s national educational fund, is one of the most highly respected grant and scholarship funds in the country. For over 60 years, ABWA has helped women achieve their business and professional success through educational scholarships. Since its inception, more than 17,000 women nationwide have been awarded more than 17 million dollars in scholarships. The Stephen Bufton Memorial Educational Fund is a 501 (c) 3 charitable trust and public foundation. It has the same tax status as public schools, churches and community funds. The fund is listed in the U.S. Internal Revenue Service “Cumulative List of Organizations” described in Section 170(c) of the IRS code of 1954 – revised Oct. 31, 1974. ← Top Ten Business Women of ABWA – Call for Nominations!